The burrowing bettong, a marsupial, is a stocky member of the kangaroo family. It is strictly nocturnal and is largely vegetarian. It occupies a broad range of habitats from spinifex deserts to woodlands and lives in burrows, which it digs itself. One of these burrows may house more than 50 individuals. Formerly one of the most common and widespread native mammals in Australia, it survives only on three islands off the coast of Western Australia. Many factors have been proposed as possible causes of its decline, including the general diversion of environmental resources to humans and introduced species, a reduction in vegetative cover by introduced herbivores and changed fire regimes, predation by introduced foxes, direct killing by people, predation by cats (particularly on islands), competition from rabbits, and competition from black rats on Boodie Island. *** The burrowing bettong is the only burrowing species of the kangaroo family. *** It uses scent to locate its food, which it then digs out of the ground. *** In the 19th century it was considered a destructive pest of settlers' gardens. This bettong had one of the most extensive continental ranges of any of the Australian marsupials, originally occurring in all mainland states except perhaps Queensland over the region from about 14 degrees South in the northwest down to the extremity of the southeast coast (37 degrees 50 minutes South), and from the west coast almost across to the Great Dividing Range in New South Wales. It had disappeared from Victoria and New South Wales by the 1860's. It remained common in parts of central and southwestern Australia until the 1930's. By 1966 it appeared to be virtually extinct over most of its former range, with remnant pockets possibly remaining in northwestern and central Australia. It was common on Bernier and Dorre Islands. By 1987 it occurred only on Barrow, Boodie, Dorre and Bernier Islands off of Western Australia; by 1992 had become extinct on Boodie Island. Proposed factors leading to its overall decline include the general diversion of environmental resources to humans and introduced species, a reduction in vegetative cover by introduced herbivores and changed fire regimes, predation by introduced foxes, direct killing by people, predation by cats (particularly on islands), competition from rabbits, and competition from black rats on Boodie Island. 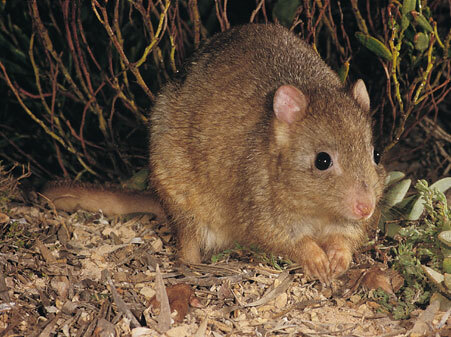 The burrowing bettong weighs about 2 kg (4.4 lb) but can be lighter in some areas. On the mainland, habitats ranged from open eucalypt or acacia woodland with a grass and shrub understory to sandridge desert covered with spinifex hummocks and sparse shrubs. In island habitats the vegetation cover consists of a variety of shrubs, herbs and grasses. The burrowing bettong is one of the species that live in the Southwest Australia Biodiversity Hotspot (Cons. Intl.) . Sexual maturity is attained within a year. Females apparently are capable of giving birth when about 200 days old. A female burrowing bettong can produce up to three litters per year. Breeding may go on throughout the year in some areas, but in the Bernier Island population most births occur between February and September. The usual litter size is one, though twins occasionally occur. Just after one young is born the female mates again, but because of embryonic diapause development is delayed, and the second young is not born for about four months, unless the first young is lost. The young leaves the pouch at about 115 days after birth but is not weaned for a further 3-10 weeks. It mainly consumes tubers, bulbs, seed nuts and the green parts of plants. Some communities have been known to eat fungi, termites and marine refuse, as well as to raid vegetable gardens. The burrowing bettong is strictly nocturnal. A male and several females form a social group and occupy a burrow. The burrow may be a simple structure with only 1-2 entrances and a short tunnel, or a large warren with more than 100 entrances. One of these warrens may house more than 50 individuals. Males are aggressive toward one another, and seem to defend groups of females but not a particular territory. Females generally are amicable, but sometimes will establish a territory and exclude other females.